By Mike Ryan, April 29, 2008 in Plugins - Publishing ONLY! Invert Alpha is a simple plugin that inverts your Alpha Channel based off of your set tolerance. This plugin is most useful when dealing with transparency gradients, creating alpha masks, and more. 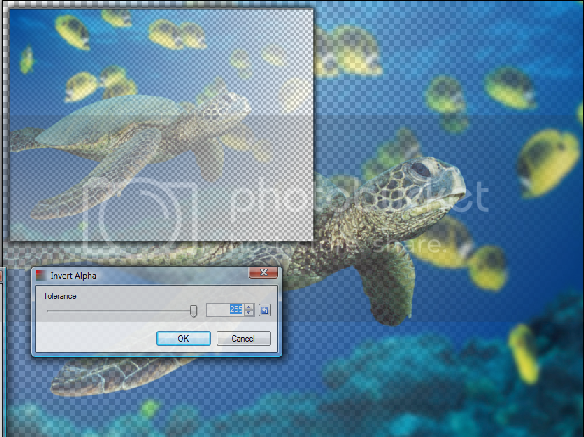 To use this plugin, simply extract the zip file to your Effects folder and restart Paint.NET. Then go to Adjustments-> Invert Alpha. Toying with the tolerance is recommended to discover some more interesting uses for this plugin. Your first real plugin! Hurrah! Also, I want to give my thanks to Pyrochild for helping me out with this basic plugin. Don't say that - people will think it's another prank! Lol, then I also want to say this is NOT a prank. Thus giving the further impression that it is, in fact, a prank. Good plugin, mostly I just use a transparent gradient, I don't really change it around, but congrats on the plugin. I look forward to seeing your plugins in future. TrueLove, while it is a basic plugin I would prefer that the source to any or all of my plugins be distributed solely by me. But I am glad that you enjoy using this plugin, and I hope it is a good start for future plugins from me. Sorry if something going wrong, I've just wrote this source by myself to recreate your work. That's will not happen again. Not a real problem at all. And you wrote it exactly as i wrote it, that is why I got confused. What bug? Who is buggin around? Anyways, this plugin is going to be superseded soon with some extra features. It will be entitled 'Alpha Works' and I wish I could confirm some extra features. Until then, good night to you all! I will begin working on Alpha Works as soon as I get some more testing in with IndirectUI. Alright, Alpha Works is finished but not compiled yet. I need Code Lab to start behaving correctly and I will make the big upload. CodeLab is fine. It's your script... Don't use anything but alphanumeric characters in the .cs file name of your effect. CodeLab uses that filename as your namespace... "namespaces" must be alphanumeric without spaces. I have added a note about this to CodeLab's help file.